Tez Morton reduced the arrears against Coventry United. 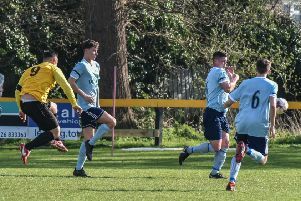 Racing Club Warwick suffered a third straight defeat when they went down 3-1 at home to Midland League Division One leaders Coventry United. Townsend Meadow had passed a mid-afternoon inspection but both sides found it tough going on a heavy pitch which deteriorated as the evening went on. The visitors opened the scoring in the 15th minute when Conal Dowling could only push Matt Brown’s header into the roof of the net. United almost doubled their lead in the 22nd minute when Josh O’Grady jinked into the box but he was denied by a post. However, he made no mistake six minutes later, firing home after an assist from captain Chris Cox. Former Whitnash Town striker Ross Briscoe brought out a smart save from Dowling before Racing Club had their first clear sight of goal, Tez Morton hitting the woodwork. Six minutes into the second half, United added a third through Cox but their three-goal cushion did not last long, Morton firing into the corner from 12 yards after a neat piece of footwork. New signing Ashley English was introduced by Racing Club and the visitors were indebted to Tommy Glasscoe for clearing an effort off the line in the 82nd minute as the hosts looked for a way back. However, it was United who came closest to adding to their tally in the dying minutes, with O’Grady just off target as he tried to find an unguarded net from 40 yards. Racing Club will be looking to get back to winning ways on Saturday when they make the trip to Pelsall Villa who lie one place below them in the table.